Major Matt Mason…just the name sounds macho! He was America’s man in space! Standing just over 5” tall, the Major was a rubber bodied fellow with an internal bendable steel skeleton. He had a snap on space helmet which attached to his permanent spacesuit. He and several other action figures that were a part of his team lived in a three-story moon station complete with a lunar walker. The moon station was comprised of a top story (the command module where the action is) with removable tinted plastic windows; a second story which was open to the moon environment (kind of like a garage for space junk), and the lower level touched the “lunar surface” and provided a place to wipe your boots. The “turbine powered-front wheel drive” lunar walker had two big multi-spoke “wheels” and the chassis dragged the ground at the rear. No wonder the Soviets never made it to the moon! GI Joe..fightin’ man from head to toe! A guy with a crew cut and a scar on his face had to be the very embodiment of suburban testosterone! All boys worth their mettle wanted to be just like Joe and many imaginary adventures allowed them to do just that. Joe did many important things…defending the free world from the Godless Communists, taking care of those pesky Third World insurgents and exploring the reaches of outer space in his sliding plastic door Mercury capsule, just to name a few…. The 1960’s Patio Culture coincided with one of the most prosperous times in American history. Despite the expenditures involved in running a Cold War globally, and a hot one in Vietnam, the U.S. provided ample opportunity for a prosperous middle class to thrive. Couples could build families on blue collar wages, and as often the case, spoil them. Kids reared during the Patio Culture Era were often showered with materialistic goods usually in the form of toys. 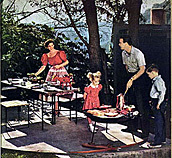 However, this newfound materialism was often tempered with the traditional childhood imagination exhibited by their parents from the Depression Era. A shiny new toy was often supplemented by a homemade one, and plain old sticks were always perennial favorites. Just like their parents, kids embarked on exciting outdoor adventures in and around the neighborhood…only they were better equipped! Perhaps the biggest school fad toy of the 1960’s, clackers are an excellent example. A simple, primitive design constructed out of space-age polymers; both old and new at the same time. Basically, this testicular looking device consisted of two colored acrylic cast balls connected with a cord with the object being the ability to hit (clack) them back and forth. The timeless simplicity of the design harkened back to the time when similiar devices, bolos, were used by early humans for hunting. If used improperly, both could be equally devastating. Once a kid gained sufficient skill to “clack” his clackers for a sustained amount of time, he would instantly gain status in the kid world. Trouble is clackers could be manufactured in various qualities and sometimes they were known to shatter sending acrylic shards all over the place. Case in point are the clackers I can remember being sold locally at Wacker’s Dime Store. They were not labeled with safety warnings…they were not even packaged. They were sold from a big pile that the kids would rummage through to find just the right color, often creating massive tangles in the cords. I’m sure entrepreneurs used Clear Cast (acrylic kit responsible for tacky homemade paperweights) to cash in on the fad. Needless to say, the tendency to shatter and their more obvious use as a weapon sent this toy to the graveyard of memorable 1960’s toys.